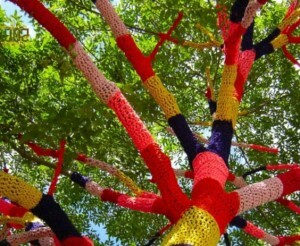 Pelham Art Center’s outdoor Courtyard will be colorfully ablaze this summer with a yarn bombing installation that will cover stretches of its brick walls, tree branches, benches, etc. with knitted “garments.” Knit Knit Bomb Bomb is a community knitting project led by Maureen McCourt and Gail Heidel to help transform the context of everyday objects as a new way to activate public space. The exhibition will run from June 26 – August 31, 2015. Community members have been participating in ongoing free bi-monthly knitting circles at the Art Center. Knitters select an object to cover with knitting or crochet, or collaborate on a larger piece, like the 90’ brick wall, with other yarn artists. An opening reception for this socially engaged art project will be held on June 26 from 6:30-8PM in conjunction with the Art Center’s Faculty and Student Showcase exhibition opening. Pelham Art Center’s mission is to provide the public with a place, the resources and the opportunity to see, study, and experience the arts in a community setting. Currently serving more than 16,000 adults and children in Westchester County and parts of the Bronx by offering high-quality free and affordable art programs year round, Pelham Art Center is committed to the belief that the public’s access to and participation in the arts strengthens communities and fosters lifelong engagement in the arts. These events and programs are made possible, in part, by the ArtsWestchester with funds from Westchester County Government. Pelham Art Center also receives funding from: New York State Council on the Arts, A State Agency; Westchester Jewish Community Services; Nurses Network of America; Town of Pelham; New Rochelle Campership Fund; the Rutsch Family; Bistro Rollin; Robin’s Art+Giving; Nycon; Junior League of Pelham, Prospect Hill Lunchtime Enrichment; Strypemonde Foundation; Mark Link Insurance; Broadway Electric, Owen Berkowitz; Members; and Annual Fund Donors. This entry was posted in Press Releases and tagged knitting, pelham, pelham art center, public art, westchester, yarn, yarn bombing. Bookmark the permalink.